How should your foot strike when running? If you take a look at most professional sprinters, middle distance and long distance runners, they land on the front of their foot (i.e. their forefoot), but they specifically strike the ground on the outside of their forefoot before the rest of their foot comes in contact with the ground (as seen below). Why do they run this way and why don’t they heel strike like most joggers? 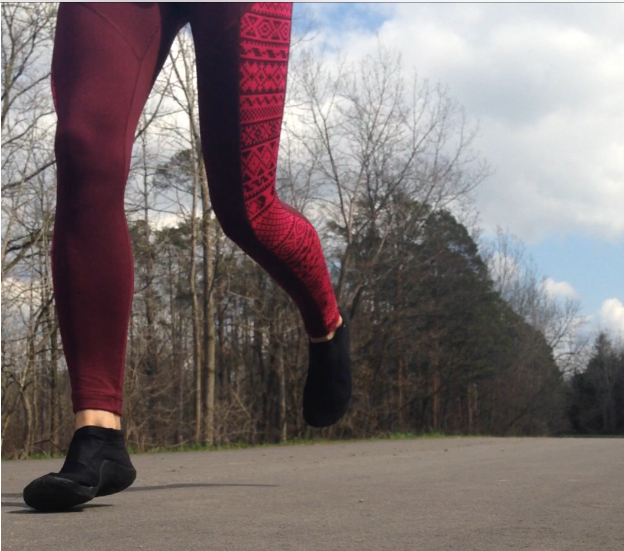 Nothing can compare to a forefoot strike landing when it comes to impact reduction during running. For instance, landing on the outside of your forefoot while you run reduces vertical initial loading rates (Lieberman et al. 2010), which may stave off bone and muscle injuries. Sad but true, most joggers don’t run this way (i.e. 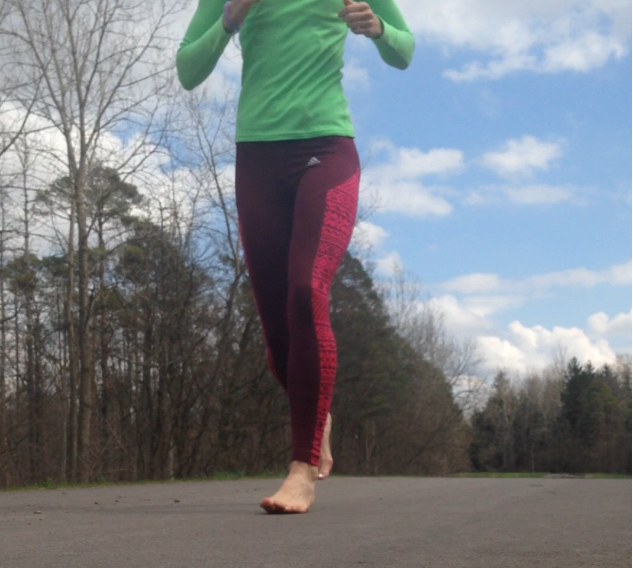 forefoot running), rather these runners tend to heel strike which produces damagingly high vertical loading rates. But like I said, heel strike running is not how most elite runners run. If you watch closely, most forefoot runners make initial contact with ground on the lateral edge of the forefoot (towards the outside), not directly under the MTP joint (the big toe). Comparatively, Breine et al. 2014 revealed that most heel strike runners landed more medially with a center of pressure trajectory that traveled near the MTP joint and had a higher vertical initial loading rate than the forefoot runners. In forefoot running, landing on the outside of the forefoot may provide an ankle dorsiflexion strategy that reduces vertical initial loading more effectively than a heel strike landing. In addition, the lateral aspect of the forefoot may have structural characteristics that load differently compared with medial aspects of the foot. For instance, the lateral aspect of the forefoot may have more fat pad density that is able to absorb impact better than other areas of the foot. Above, is the forefoot strike of Usian Bolt -notice the tendency of the foot to land more laterally at initial contact. Unlike forefoot runners, heel strike runners have less kinematic resources to reduce vertical initial loading rates and must rely on shoe cushioning for added protection (De Clercq et al. 1994). The heel pad is also used as a shock absorber in heel strike running, but is considered fragile as it deforms easily at high running speeds, regardless of under-heel cushioning of a shoe. Because heel strike runners wear cushioned footwear and produce higher vertical initial loading rates, casts doubt on the concept that shoe cushioning is protective. Conversely, the basic shock absorbing abilities in the foot have existed for millions of years and depending on how you land, determines whether the foot provides full impact protection. Until recently, impact absorption in running was confined to a running shoe, but now researchers are beginning to independently verify that runners can obtain distinct impact absorption by landing towards the outside of the forefoot. De Clercq D, Aerts P, Kunnen M. The mechanical characteristics of the human heel pad during foot strike in running: an in vivo cineradiographic study. J Biomech. 1994;27(10):1213–22. Lees et al. Shock absorption during forefoot running and its relationship to the medial longitudinal arch. Foot & Ankle Inter, 2005;26(12):1081-88. Lieberman DE, Venkadesan M, Werbel W a, et al. Foot strike patterns and collision forces in habitually barefoot versus shod runners. Nature. 2010;463(7280):531–5.